Stop 20 AM&PM® is a special formaulation carefully developed to prevent and reduce the symptoms associated with SEVERE Exercise Induced Pulmonary Hemorrhage (EIPH), commonly known as Bleeding, in performance horses. 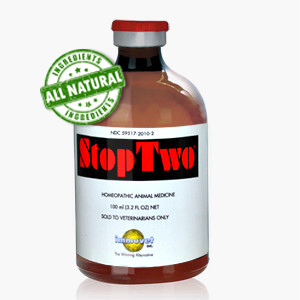 Stop 20 AM&PM™ is a special formulation carefully developed for the prevention and relief of symptoms associated with SEVERE bleeding(EPHI) in race horses and other breeds. 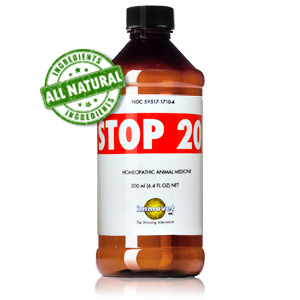 Veterinarians, trainers and owners have used Stop 20 AM&PM™ and have achieved amazingly successful results in just 20 days. Reduce the incidence of chronic cases which sometimes has been reported to be associated with pulmonary mycosis a hidden cause of a Severe type of bleeding. 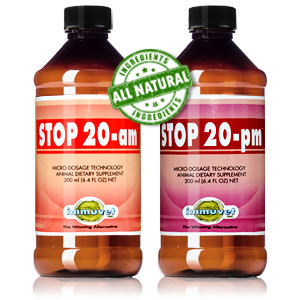 Stop 20 AM&PM™ comes in a set of two 200ml bottles. Give 10cc of STOP 20 AM to your horse in the morning on an empty stomach 30 minutes before feed and 10cc of STOP 20 PM in the afternoon on an empty stomach 30min before feed for 20 days. Avoid great efforts and DO NOT BREEZE your horse for the first 20 days of supplementation; only light training (walking and/or light jogging) should be practiced during the first 20 days. Normal training can be resumed after the first 20 days of supplementation. Your horse is ready to race at any time after day 20.